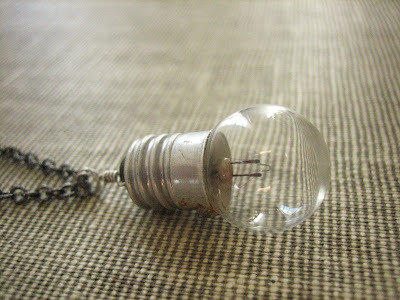 Donated by etsy shop owner Lovely Musings, it’s a vintage dollhouse light bulb which hangs from a delicate gunmetal chain. 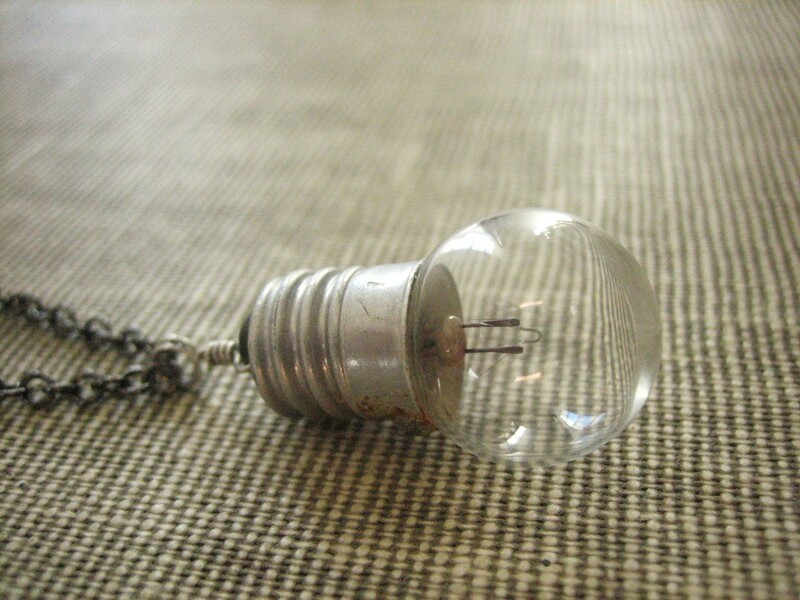 This vintage incandescent light bulb is absolutely adorable, and aside from its metal being slightly tarnished, it is in wonderful vintage condition. This whimsical necklace is the perfect accessory for any vintage lover. The vintage light bulb measures 1” tall. The necklace measures 21” in length. Please let me know if you’d prefer a different necklace length, I’m happy to make alterations. Thank you for looking! All items are lovingly handmade and packaged prior to shipping. I follow your twitter (@JulieHeartBooks), your blog, and Myra on twitter. +1 I really like the Vintage Heart Necklace!!! +1 i really love the Tiny Fairy Necklace!!! Such a cute necklace and I can’t wait to read Hourglass! I absolutely love the necklace. That necklace is amazing! Thanks for the contest! I favorited Lovely Musings on Etsy and my favorite piece is by far the amethyst bullet shell necklace. I favorite Little Red Reads on Etsy and I love the Time Flies handmade journal. I posted on Facebook about this contest. Cute idea for a necklace! I love that necklace. Thanks for the giveaway! +1 favorite item is this one: http://www.etsy.com/listing/36239280/the-soul-and-a-dove-caged-bird-necklace Really beautiful! I follow you and your shop is one of my favorites on Etsy. What an awesome necklace! Thanks for the giveaway! Wonderful giveaway! the necklace is beautiful! +1 My favorite item is the Vintage Brass Bar Necklace! It’s such a simple accessory, yet it’s strikingly unique. So pretty and unique..love it!! I found you from the Lucky Leprechaun Blog Hop,i am looking forward to visiting again. +1 i think the Petite Geode Necklace is awesome!! Love, love the necklace! It’s so unique. I’d love to be entered to win. I love this. It’s insanely cute. That is such an odd but awesome necklace!Very original! +1 I love the Multicrystal bullet shell necklace! +1 I love Toadstool Fine Photograph! So cool! Aww this is really cute!! “The Home Is Where The Heart Is” is one of my favorites on the LittleRedReads etsy i like the intrical detail. This is lovely, one of my favorite Etsy contests yet! This is definitely my favorite item on her Etsy account so far. I love the idea of it! +1 Added LovelyMusings to my favorites on Etsy (SweepstakeLover). +1 I like the Eye Spy Necklace from her shop. +1 I like the Sweep Inspired Necklace from your shop. This got to be the most unqiue necklace I’ve seen by far.